I am generally a pretty cynical person, but there are some stories that are just so pathetic that you can't help but get drawn into the calculated, Victorian sob-fest. Witness: The (adorable) Humiston Children. On July 1, 1863, Sgt. 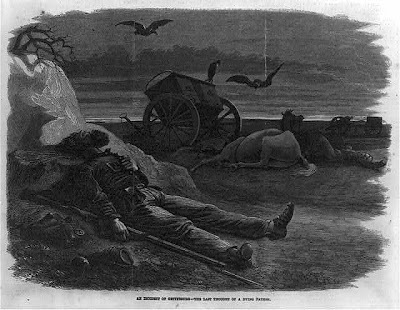 Amos Humiston of the 154th New York Volunteer Infantry was killed as his regiment retreated through the streets of Gettysburg. By the time a burial detail recovered his remains after the battle, he was unrecognizable and had no identifying papers or markings. According to newspaper accounts, which are probably embellished for maximum tear-jerking, the only clue about his identity was a picture of three children that he clutched in his hand as he died. In an effort to identify the soldier, somebody had the bright idea that they should publish the photograph in newspapers because, hey, somebody's going to recognize those kids, right? And what an awesome way to let somebody know that her husband is dead. 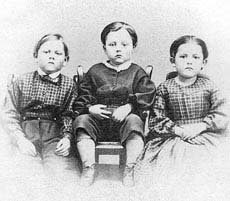 On October 19, 1863, the Philadelphia Inquirer published (a description of) the photograph under the headline, “Whose Father Was He?” The story was reprinted in many newspapers, and Humiston’s wife, Philinda, eventually recognized her children: 4-year old Freddie, 6-year-old Alice, and 8-year-old Franklin. * The tragic story of the Humiston children became a fundraising cause throughout the North, and so much money was donated that the Humistons built a house for war orphans in Gettysburg after the war. The Humiston photograph was reproduced on cards for sale at Sanitary Commission fairs and adorned the covers of sheet music. Today, there is a monument to Humiston and his family near the spot where his body was found. I used this story in my monument paper as part of a discussion of how recent monuments at Gettysburg are trying to transform the battlefield to divert visitor's attention to the human tragedy rather than the fighting or the causes of the war. In the last 15 years, we have seen new monuments such as the "Friend-to-Friend" Masonic memorial and the Maryland state monument, both of which depict suffering, unarmed men helping their supposed enemies, as well as monuments such as the Humiston and Elizabeth Thorn memorials. All of these shift the conversation to mutual suffering, almost as if the battle were a natural disaster or some other sort of inevitable tragedy that Americans endured through no fault of their own. I'm not saying that we shouldn't honor Elizabeth Thorn or tell the story of Amos Humiston, but the trajectory of the memorial landscape does not get to the heart of the issues of freedom and equality that brought people to Gettysburg in the first place. If you're interested in a straightforward account of the Humiston story without all the handwringing about memory and erasure, check out Mark Dunkelman's Gettysburg's Unknown Soldier: The Life, Death, and Celebrity of Amos Humiston (1999). *Update (3/31/09): It seems that my initial discription was a little bit off — the original newspaper accounts apparently carried descriptions of the photo, but not reproductions of it. Philinda Humiston recognized a description of the photo and sent away for a copy to make certain that the dead man was her husband.